An unnamed 24.7 metre Hatteras 80 motor yacht, listed for sale by Joel Brakha at Interglobal Yachts, has been sold with Raymond Young at RJC Yachts introducing the buyer. Built in GRP by US yard Hatteras, she was delivered in 2004 as an enclosed flybridge model and was refitted in 2014 with a new interior by Shelley Design. The interior now features high gloss African mahogany joinery, granite counter tops, custom furniture, designer fabrics and rich leathers. Accommodation is for eight guests in four cabins consisting of a master suite with a king sized bed, two doubles with queen sized beds and a twin cabin, all with en-suite bathroom facilities. The large aft deck is designed for al fresco dining, with a curved settee, dining table, chairs and a wet bar and fridge. The saloon comes with a sunken bar, leather club chairs and sofas plus a full entertainment system including a 46-inch Samsung flatscreen television. Forward is a formal dining area with seating for eight guests. The enclosed flybridge is perfect for entertaining in all weather conditions with air conditioning and heating, and includes generous seating, a full bar, electric grill, fridge and a Jacuzzi. Twin 1,550hp Caterpillar diesel engines give her a comfortable cruising speed of 20 knots and she is fitted with Trac zero speed stabilisers. 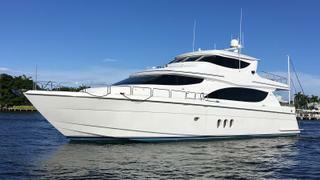 The Hatteras 80 was asking $2,239,000.